These themes pervade Magica Madoka, particularly informing the final two episodes. They are also important ideas in religious traditions, namely Christianity and Buddhism. The Buddhist principals expressed in Madoka Magica are so pervasive, that I’ve started to think that the Christlike imagery I immediately saw when viewing episode 12 wasn’t at all planned by the show’s creator. After all, while the burden of sin on the Christ figure in the story is obvious (as are ideas like God living out of space and time and Madoka’s visit with Akemi resembling Jesus’ visits with the apostles and others before his ascension), other actions are harder to reconcile with Christianity. Maybe I’m just being euro centric, applying western thinking to an eastern medium. Not that I have a problem with that – this is what I do on this blog (spoiler below). Whether or not the Christian spirituality expressed in the final episode was intentional, it’s undoubtedly there. But beyond the Jesus metaphor, what Madoka’s final sacrifice shows is the state of fallen man and the value of Jesus Christ. One of the most famous images of the Bible is of the Garden of Eden – a place of serenity and peace, where man knew no sin. After sin, Adam and Eve were cast out of Eden into a harsh world where sin would reign – where it would deteriorate the world spiritually, physically, and emotionally. A common question tossed at Christians, often with bitter and angry words, is this: if there is a God, why does He allow suffering in this world? This question leads many to the conclusion that even if the Christian God exists, they will not follow Him. The answer, according to Christianity, is because we live in a fallen world – a place where sin and Satan rule and where life is often out of our control. In Magica Madoka, the girls make a deal with the Kyube (like Adam and Eve agreeing to eat the snake’s apple) without realizing the full consequences of the act. After making their contracts, instead of receiving their wishes (compare to Adam and Eve wanting to be like God), they are led into a difficult, cursed life. Adam and Eve, too, received curses (toil the land, brother! deliver children in a most painful way, sister!) – and they passed these down to generation after generation. Once you’re born into being a magical girl, you’re stuck with a painful life and a most horrid end. Madoka Magica is about Hope. Or, for 11 epis­odes worth, the lack thereof. As soon as you entered the world of the Magical Girl, you had lost all hope of return­ing. You turned into a witch when all hope had been extin­guished and you had given up on life entirely. She took the burden placed on herself by Homura’s actions, and even larger, the burden of all the contracts made by magical girls throughout history, and made them her own. She battled these curses and won. The parallel is obvious – Jesus took the burden of sin of all mankind, battled them on the cross, and won. Don’t forget, always, somewhere, someone is fighting for you. As long as you remember her, you are not alone. Christ, too, ascended to be with the Father – but He leaves the Holy Spirit with believers. We are not alone. We are freed from the burden of sin, and we are forever in the company of God. Likewise, Homura is left with the red ribbon – like the red string of fate that connects lovers (Christ’s relationship with believers is described in the Bible in such intimate terms) and like the seal of the Holy Spirit – helping her to remember that she’s not alone. Madoka was not able to bring absolute salvation to the world – even though she erased witches, there are still plenty of other curses in the world, with demons being the new ones introduced at the end of the series. The new enemy isn’t as fierce as that of old, but it is dangerous nonetheless. The curse of the witches is gone, but in its place are demons that still cause death and suffering. Likewise, we all still live in a world of sin, despite Jesus’ sacrifice. Suffering still occurs. It still falls on the good and the bad, the deserved and the innocent. We’re still in a world that is relentless in fighting us. But this life, through new eyes and a new heart, is much better than the previous. The magical girls must still fight, but they no longer live under the witch curse. Christians still experience the consequences of sin, but are given a new heart as they look forward to a future destination. Madoka provided hope for the girls. Jesus gives hope for us all. Magica Madoka not only gives parallels between its main character and the Bible’s – it provides an amazing framework for understanding sin and Christ’s redemption. These ideas, I think, ring true universally. Perhaps that’s part of why many found the final episodes to be so emotional (catchercatch and DeShaun Zollicoffer among them). For me, Magica Madoka was more than entertainment and more than emotional – it was a religious experience. It is a show that has the power to transform. It is the gospel, as told through Faustian imagery and magical girls. I love the comparison between Kyubey’s contract and the apple. The irreversible fate of magical girls stems from that sin. And it takes an selfless sacrifice to reverse that. It’s a tale of Jesus’s sacrifice and our original sins. Thanks! And thank you for that great post about the Buddhist philosophies incorporated into the show. I’ve studied Buddhism, but it’s been years and I would’ve missed all of the connections if it wasn’t for your extensive post! Perhaps this is slightly off topic, but there almost seem to some parallels between Kyouko and John the Baptist. She prepared the way for Madoka’s sacrfice in a sense, offering a way to live but not purporting it to be *the* way to live either. She also met her end at the machinations of Kyubey just as John met his end due to Herod. I’m probably just thinking about this too hard… or perhaps not hard enough. “Adam and Even, too, received curses” — Tee hee. Not trying to be a spelling nazi, I just found it amusing. That’s a good comparison! I also think that Homura works well as a John the Baptist figure (the “Church of Madoka” has already identified her as a “prophet”), though Kyoko is perhaps more similar. I always enjoy what I see and feel being put into words, and in concrete details. Before, I know the emotion, but not the concrete details that supported that emotion; and now, your analysis illustrated the finer point for me. I agree with you, watching Madoka is a religious experience. It speaks to me about Christ, about being a Gospel story, and about a way for me to explain to anime-fans about the nature of Christ and the hope He gave me, give me, and will give me. Madoka looks like it may become a watershed anime – one that will have a major impact on the industry. Likewise, I think that Christian anime viewers should see this as a watershed anime for a different reason. It’s a massively successful anime with a legion of fans that can bring the message of hope to those who don’t know Christ. I’m reminded of Paul telling how he becomes all things to all people – I’ve never seen an anime (U.S.-created productions excluded) that has the potential to so powerfully show the gospel message. This is exactly what I thought after finishing this series. It would be so easy to explain the Good News to a Japanese person using examples from Madoka. I believe that since mankind was created in God’s image that every culture expresses God’s truth in different sin-distorted ways. Contextualizing the Gospel is not a matter of changing the Gospel to suit a culture’s understanding, but taking their culture and showing how the Gospel is the ultimate truth and fulfillment of the core beliefs they already hold. Every culture has “savior” stories. Every culture has stories of sacrifice and redemption. Madoka is another one of these stories and can be used to show the Truth and bring God glory. We are missionaries to Japan. We returned to the US last summer after 1 year in Tokyo. We didn’t want to leave and we’re waiting to see how God will get us back. I want to do everything I can now to prepare to proclaim the Gospel in Japan as effectively as I can. First priority is always to seek God above all else and fill my heart with His Word (in Japanese!) so I am ready to answer, but if I can use Madoka to help a Japanese person better understand parts of the Gospel, I’ll do it! I’ve never been so excited about religious themes in an anime before and I’m excited to see how God can use this! Thanks so much for sharing your thoughts and opinions. I didn’t know there were so many others who appreciated the Christian themes that appear in many anime! Likewise, it’s great to see someone support an idea I’ve been thinking – that this anime could be a powerful evangelistic tool. It’s very cool to read comments from a missionary to Japan! The fact that this episode ended up being aired on Good Friday is a fortunate coincidence. Or perhaps intentional? A lot of people have commented on that. My guess, without any type of additional knowledge, is that the studio took advantage of that date and things fell into place like that. Regardless, it was a perfect time for this amazing episode. I’ve been looking forward to your comments on this series. Not long after finishing the final episode I found myself thinking of CS Lewis’ fiction and the way it presents alternate ways to view and understand Christian symbolism. That’s a great comparison – it is like a C.S. Lewis novel. And like The Lion, the Witch, and the Wardrobe, the sacrificial scene is powerful and moving, I think even to those who don’t see the parallel to Christ. I think an anime like Madoka or other media that presents Christian themes underneath the surface level is a wonderful and maybe more effective way to explain Christianity in this culture. Absolutely! 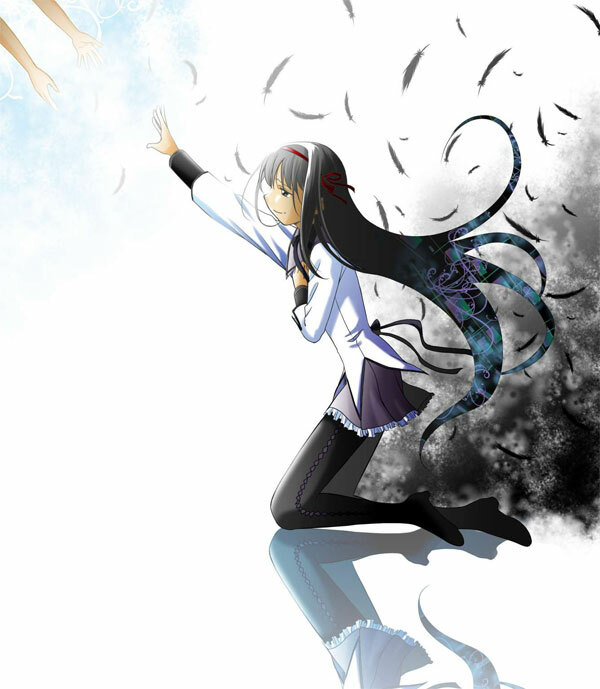 When Madoka leaves, she lets Homura know that she’s fighting for her and that she’s not alone, which is like Christ going to be with the Father where He can intercede for us, while leaving the Spirit with us as well. Thanks for adding the scriptural reference for this! Madoka Magica, intentionally or not, really does present the gospel in a wonderful, creative manner. Heh, well I hate to rain on everyone’s parade, but I think my two cents are worth being heard (don’t we all think that way =P ). Starting off with the metaphor of comparing Kyubee to the snake in the garden. I feel this is completely inaccurate. The snake has vindictive and destructive goals in mind. The snake knows what he is doing is evil. Kyubee simply lacks understanding of human values, which is a big difference. Also, his goals are laudable and extremely pure, even if his methods aren’t from the human perspective. While I think it’s easy to draw parallels between Madoka and Jesus, the sacrifice of Madoka feels much more compelling and sincere than that of Jesus. After all, Jesus already being a god would know the outcome of his actions beforehand. Madoka starting off as a mortal doesn’t have the benefit of such knowledge. It’s truly selfless and most of all, a permanent and complete sacrifice because the only being to know of Madoka’s good will is Homura. In this way, I feel that the story of Madoka is better than Jesus because he starts out on different level than us. Madoka brings the role of savior down to our level. Jesus didn’t stand to lose anything and Madoka nearly loses everything. We need to understand the joy Madoka finds in helping others. By default we can never be Jesus because we lack divinity. But if we look at what we CAN do in this world, maybe we can be like Madoka. The question about whether Jesus’ sacrifice meant anything less because of His divinity. A key to this would be his dual nature of man and God. What often draws non-believers to Christ is his humanity; what draws Christians closer to Him is the same, but not only in how He feels about others, but in how He suffers like us. It’s what makes the event very compelling – Jesus asks His dad to keep Him from dying – how much more human can that be than to try to avoid the immense pain awaiting Him at His execution? Of course, the torture and death, too, adds a dimension to the story that is more graphic than in Madoka. As for Kyubee, great points. The metaphors I use on this blog almost NEVER work on all levels; in fact, they usually only work on very minute levels. No surprise, since almost no manaka or animators have Christianity in mind at the slightest when creating their series. However, I do think the serpent metaphor does work in this way – Kyubee IS manipulative – I don’t think he’s the innocent, only doing what is in the best interest alien that he presents himself as. He withholds information and uses his apparent helplessness to create a sense of sympathy to help his goals materialize. And while that might be debatable, this isn’t so much – as with Lucifer, Kyubee will use others to further his own goals, even at their detriment. Lucifer could hardly have been thinking of how great it would be FOR Eve if she ate the apple, and Kyubee doesn’t care less about the curse the magical girls are under if they accept his/her/its contract. Each does what they do with their own goals in mind – even if Lucifer’s end goal may have to do with the pain and destruction to his “tools,” whether Kyubee’s “tools” are more incidentally damaged. I’m so late to this party. While I do feel that there are some strong Christian parallels (that the Japanese probably wouldn’t get for the most part because there’s usually just a very shallow understanding of the story of Jesus and culturally, Christianity probably isn’t the first religion to come to mind when they view it), I think the overall more convincing argument is for Buddhism. Or it could just be that the elements for both options are just so similar that they can be interpreted to whichever the viewer identifies with more. I agree with you that the Buddhist elements of the series are probably stronger than the Christian ones. But both are certainly intentional. Earlier in the series, the creators establish this by using the apple symbolism in the story involving a Christian minister. And though this might be coincidental, the finale, which aired weeks after it was scheduled (because of the Tohoku earthquake), aired on Good Friday. Excellent post! I just finished Madoka Magica today (marathoned it in 2 days) and in the final episode when Madoka uses her wish to erase all witches, and take upon the curses of the other girls upon herself…..I was like, wow, so emotional. I was crying, even. Such a gentle soul—in a series that seemed so bleak, dark, and hopeless, in the end, Madoka brought light. She never stopped hoping, even though everyone else before her fell into despair no matter how much they tried. Her wish was selfless through and through. I like how Madoka never stopped believing in hope, even when it seemed useless. No matter what she witnessed, no matter what Kyubey told her, she held onto this hope, which with her sacrifice, she was able to make a reality. I feel the series, despite its darkness, has a message about hope. It reminds me of the themes I always like to convey in my own stories—I like them dark, but hope is never absent. When it seems hopeless, “hope” is always present, telling you otherwise. I did briefly thinking of Christ’s sacrifice for us when she took upon her the curses of the other Magic Girls, so that theme was obviously present, whether intentional or not. Yeah, there’s definitely that juxtaposition in the series. It’s a very dark show, even more so because of how cheerfully bright we expect it to be in comparison to the reality of the events that occur. The finale, though, does provide hope. And so, if the show has one theme, it’s this: a powerful, sacrificial love can break down the walls we build up through our selfishness, bitterness, and ignorant decisions. It’s really a great, uplifting message that shines in a series that could have ended on a more depressing note. “It’s good, but it’s not that good…” Over-hype- the silent killer « Watashi wa bucho!! I just watched this episode. Between tearing up, I could see all these parallels to Christianity easily – of course I had been tipped off to it from going to a Madoka panel only months after it aired. The only thing I see that stops me from making the parallel between Christ and Madoka is that it is Homura – not Madoka – who goes through all the suffering and sacrifices in order to save the one she loves. Not sure how to put this into words at the moment, so I’ll save it for my own blog post. Oh man, such a powerful, powerful episode. A real tearjerker. Gen LOVES christian doctrine, but is still a Shintoist (Pagan). Arguably Kyubey is god; harming people for his plan to continue the universe, extend maximum entropy, which would be constant with the christian themes of other projects he’s worked on. It also fits with his character design, White is associated with order, Kyubey is fighting against entropy(chaos); in pagan mythology the judeo-christian God is considered a white spirit. Madoka is certainly not Christ from my reading, she is simply a good girl who ascends to god hood. A lot of themes in Gens works conform with Nietzsche Ubermensch, rejecting the status quo, “God is Dead”. Madoka fits that more than a Christ figure, that any mortal can become a god by shouldering the suffering of humanity, that we need to do that, to reject god’s answer to move forward. If I know my bible, That’s one of the big ten. Understand, Gen Urobuchi is Satan in a man’s clothing, but Satan isn’t nearly as bad as he’s made out to be. You can sit down and have a beer with him. Anyway, thanks for enlightening me about other possible influences he had and other places he may have intended to go with his allegories.